The election results are in and it’s no surprise that Chicken Marsala is the clear winner for tonight’s dinner. The prosciutto brought in many mental votes while preparing for this meal. 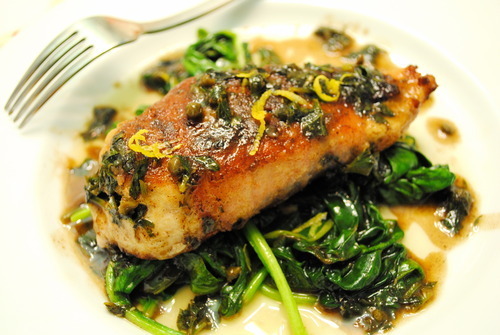 Capers, butter and velvety spinach won by a landslide in the accents department. If the staunch policy of this succulent dish is to promise unmatched contentment through means of flavor and nutrition, it will forever have my vote. * 1 Tbs. extra virgin olive oil, plus 1 tsp. Start by preheating your oven to 350. Place 3 sage leaves in the center of each prosciutto slice, then wrap each chicken breast inside the prosciutto. Heat the oil and 1 Tbs. butter in a medium skillet. On a small plate, combine the flour and pepper. Dredge the chicken through the peppery mixture, then once the butter is a tad foamy, place the cutlets in the pan seam-side down. Cook the chicken for about 3 minutes per side, allowing the prosciutto to get nice and crispy. Transfer to a baking dish and cook in the oven for about 15-18 minutes, until the chicken is done. Back in the skillet, reduce the heat to medium low and add the marsala wine. Scraping up the browned bits, simmer and stir for another 3 minutes. Add the capers and parsley, along with the last Tbs. of butter. Oh, yes. You read that right. Let the sauce thicken for a few seconds. Pour into gravy boat or bowl until ready to serve. Lastly, back in the skillet, wilt spinach over 1 tsp. olive oil. Add lemon juice and zest right before serving. To serve, place some spinach in the center of your plate. Top with chicken breast and drizzle with marsala sauce. Don’t they say you vote with your mouth? Oh, I'm so glad you loved it! Thanks so much for letting me know!